Back when I was earning enough money to pay tax, I also gave quite a lot to charity (not “a lot” in comparison to what I was spending on myself, but enough to make me feel like it was a lot). So I still get calls from these charities. But I found myself asking to be removed from their contact list last week, and I’m trying to properly work out why (besides not having a job). Perhaps my main concern is my old mistake of seeing financial donations as being enough, and as a justification to carry on doing what I’m doing the rest of the time. Giving money in place of direct action is efficient and organised, but only momentarily thoughtful, and also disconnected from the underlying problem which is kept at a safe distance by automatic electronic monthly standing orders. I guess I no longer want that insulation. Often it left me disconnected because I was supporting causes on the other side of the world. Often I would neglect smaller actions on my doorstep; small actions can easily be dismissed or left unattempted because they are not large-scale and directly life-saving (they also involve a bit more effort). But increasingly I get the feeling that troubles abroad are caused by a sickness in my own culture at home, a culture which maybe requires the exploitation of poorer cultures in order to thrive. So it’s more comfortable to focus on the distant cultures. I see much salesmanship in the charity sector these days, and it concerns me and puts me off – charities smell increasingly like corporations to me, so I worry about what might have happened to the underlying principles. The lines between corporate and charity get increasingly blurred… can charities address a problem at its root when the root is also the hand that feeds them? Fundraising specialists call me up and market the terrible things happening and the wonderful work being done. It is not that I don’t think good work is being done on the ground in many cases, or that the fundraiser herself doesn’t care. It just all feels a bit impressively presented and conveniently packaged, like a little blue pill with a smiley face on it, and too many steps removed from reality to allow true compassion to get a look in. Just sympathy and good intentions. Which are good, but not enough. Doesn’t matter! – all I’m being asked for is money. I can pay NSPCC to stop cruelty to children, and a cleaner to clean my house, a school to educate my kids and an au-pair to play with them, and Amazon or Tesco to deliver my shopping. It’s part of a clever outsourcing model, of institutional solutions. While the elements of my life are carried out by paid representatives, I can focus on getting paid to provide some other specialisation for someone else, like turning wilderness into holiday homes or persuading people to consume more sugar. If all goes well, I need never get paid a visit by my own responsibilities, or give further thought, care or time to the outside world. But along the way, I contribute towards the creation of long-distance problems… which large charities can get their teeth into… funded by donations I earned causing the problem. From a human perspective, this sounds insane – it’s a model of dependence and therefore lack of freedom, and a fragmented, harmful life. From a business perspective, on the other hand, it sounds like a Healthy Economy. And anything that boosts the economy feels justifiable. But the truth obscured by this disastrous mindset is that I cannot outsource my own responsibility and detachment has no honest justification. I’m not saying that I think giving money to charity is wrong; that would be stupid. But it’s part of an overall system design that is clever and convenient, but deeply wrong. So I’d rather practise doing some of the thinking and caring myself, rather than pay an organisation. As an individual, I won’t be saving any lives, I expect. But it feels closer to an alternative that tries not to exploit, poison or impoverish in the first place. Completely agree, I did this a little while ago too. 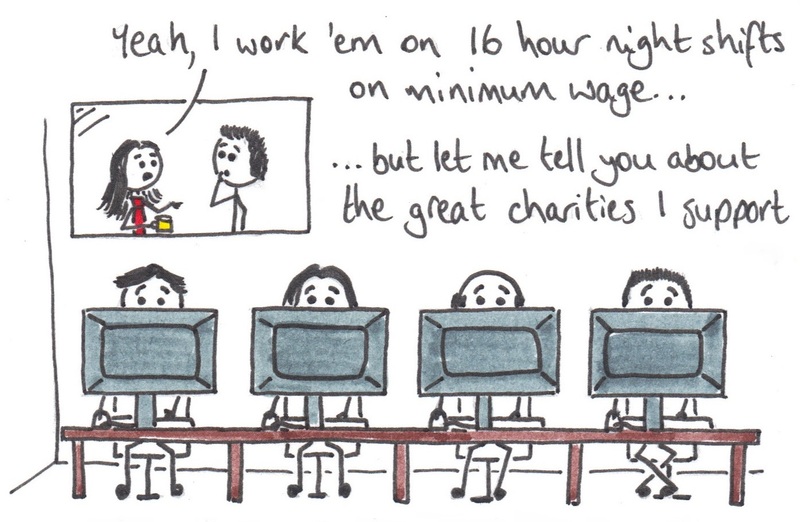 It’s not that charities don’t do great work, they (mostly) do. It’s just the ‘outsourcing’ your giving to just being purely financial that feels wrong.